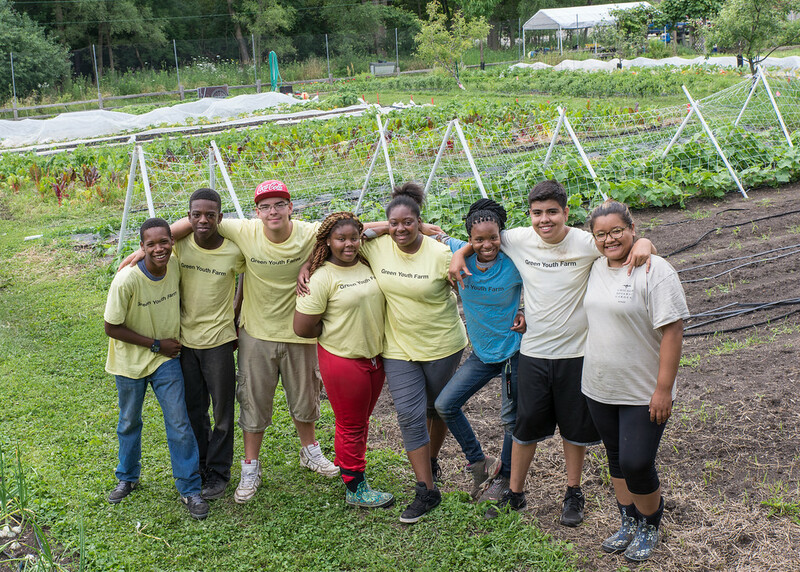 ‘Tis the season for the harvest bounty at Windy City Harvest! 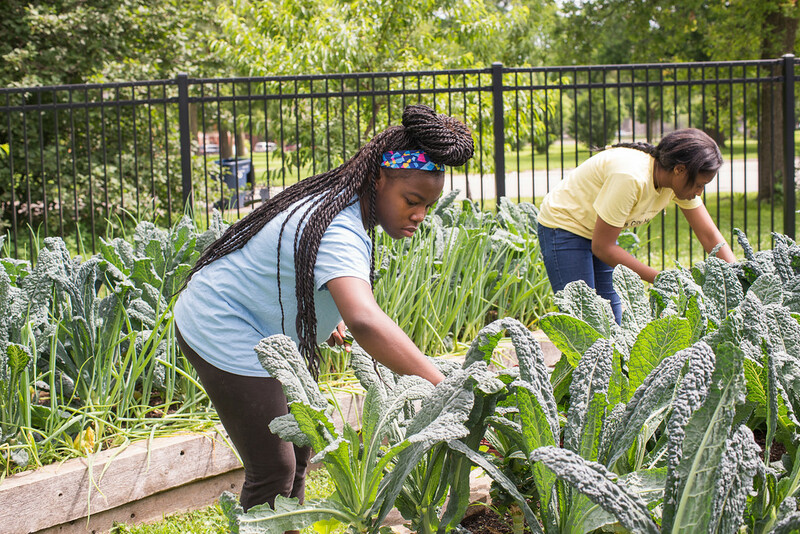 Our staff and program participants are busy harvesting our final summer crops: peppers, tomatoes, and eggplant; and early fall crops: kale, carrots, and cabbage. This harvest season we are excited to unveil our new cookbook, Cooking in Season with Windy City Harvest. This cookbook is a collection of our favorite seasonal recipes and features the fresh produce grown and harvested at our farms transformed into healthy dishes by our program participants, staff, and local chefs. Our program has been lucky to develop wonderful partnerships with local chefs and restaurants. Many of these chefs, including Cleetus Friedman, executive chef and creative chef for Caffé Baci; and John des Rosiers, chef/proprietor of Inovasi, Wisma, and The Otherdoor, have generously shared seasonal recipes that feature Windy City Harvest produce. 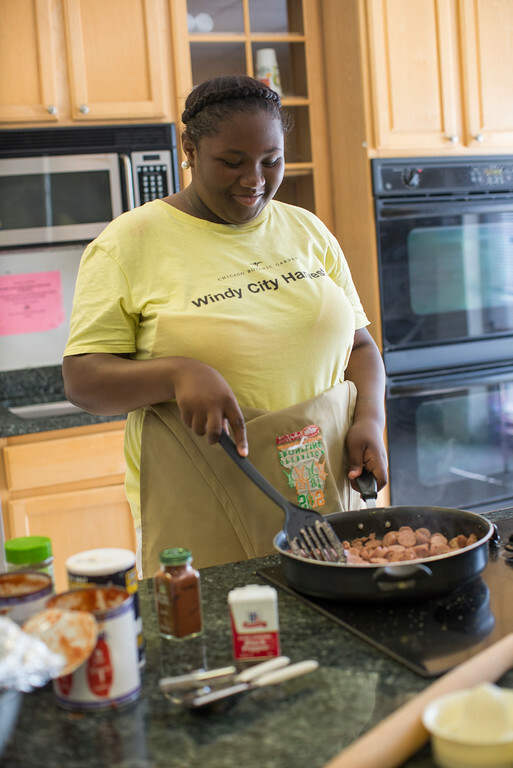 Just like planting seeds and harvesting the bounty, cooking is an essential component of the Windy City Harvest program. Program participants learn how to cook with produce grown on the farms, sometimes using fruits and vegetables that may be unfamiliar to them. The participants then share their newfound culinary skills with their communities, whether trading recipes with market customers, providing cooking demonstrations at local WIC (Women, Infants, and Children) clinics, preparing multicourse lunches for their peers, or showcasing their dishes at our annual Open House celebrations. 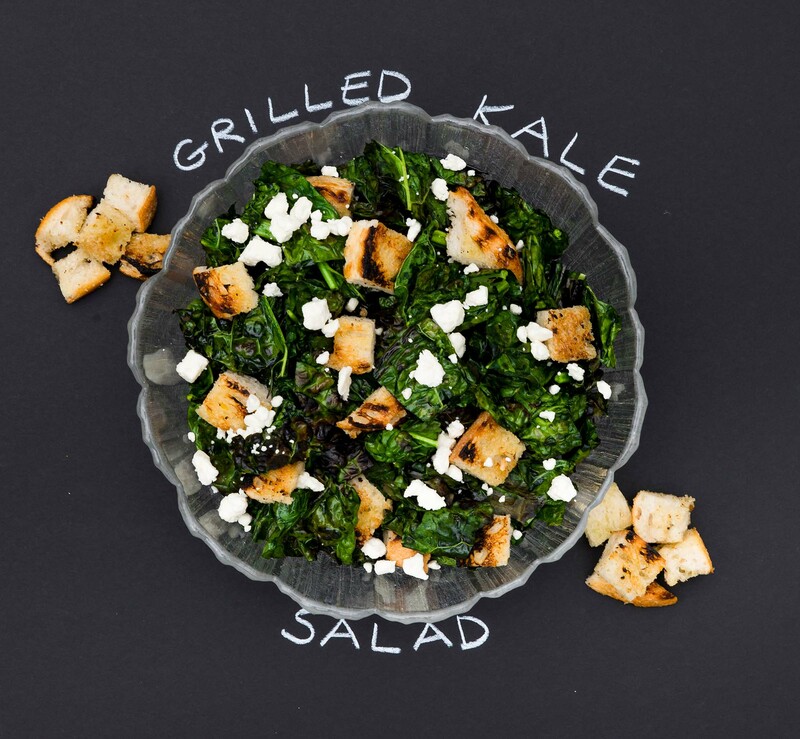 One of our favorite fall recipes is a grilled kale salad. Preheat the grill to high. Stack the kale and cut off the thick end of the stems about 3 inches from the end of the leaf. Compost the stems. In a large bowl or large plastic bag, toss the kale with ⅓ cup of the vegetable oil and salt, until the leaves are evenly coated with oil. Rub each slice of bread with a garlic clove half. Drizzle the remaining oil on the bread. Grill the bread slices until golden brown with nice grill marks on each side. Set aside. Grill the kale leaves until crispy and cooked—about 30 seconds to 1 minute per side. Dice the grilled bread into croutons, and julienne the kale into bite-size pieces. Place the mixture in a large bowl. To make the dressing, combine the minced garlic with the lemon juice, olive oil, and salt in a Mason jar. Tighten the lid and shake the jar vigorously to combine the ingredients. Pour the dressing over the kale and bread, and toss the mixture to coat. Add the feta and toss again. Transfer the salad to a serving platter or bowl. If you would like to see more seasonal recipes and learn about the Windy City Harvest program, purchase a cookbook from createspace.com or pick one up in the Garden Shop. Bon appetit! Parents! Here’s a kid-friendly, fun-to-make idea from Kasey Bersett Eaves, who “talked squash” with fall-minded visitors at the Regenstein Fruit & Vegetable Garden on a gorgeous fall weekend. With winter squash and pumpkins readily available at grocery stores and farmers’ markets, a nicely spiced fruit leather is a great way to use a post-Halloween pumpkin (uncarved) or extra can of purée—and to get kids to eat their vegetables in a new and tasty way. Super simple to assemble, it’s a whole lot healthier than candy! Kids and adults love the cinnamon-y pumpkin flavor. Purée all ingredients together by hand or in a blender or food processor. Spread purée on a foil-lined or greased cookie sheet, and smooth until just a little more than ¼-inch thick. Bake on your oven’s lowest setting (around 150 degrees) until no longer sticky to the touch (this takes close to eight hours). Remove and cool until you can lift the edges and corners of the pumpkin leather off the foil or cookie sheet. Peel off and cut into strips. 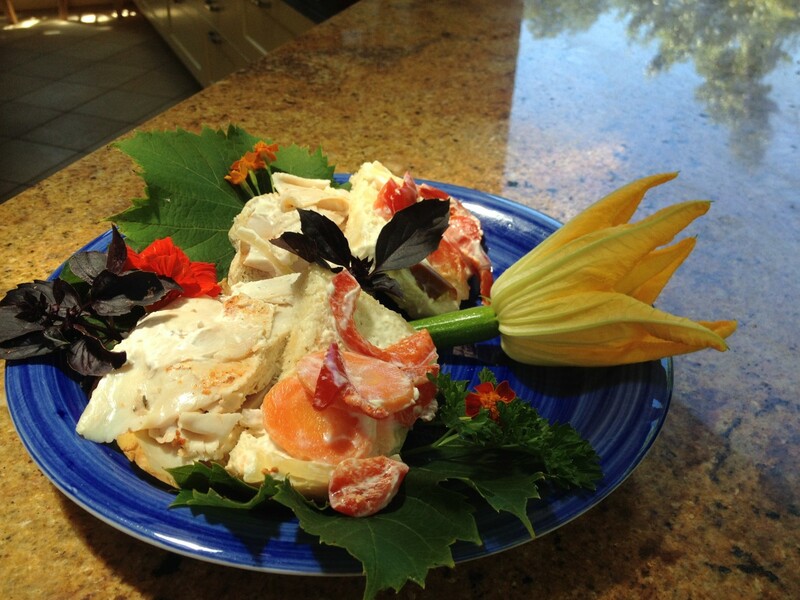 Roll each strip into plastic wrap and refrigerate until ready to eat. If you have a food dehydrator, it’s even simpler. Spread the purée on the plastic sheeting provided with your dehydrator—or wax paper—and dehydrate until no longer sticky. Roll, refrigerate, and snack away! It’s a kid-friendly process: first, blend purée with applesauce and spices to taste. A tin foil lining makes cleanup easy. Fresh-cut pumpkin (which is actually a squash) has a much higher water content than canned pumpkin. You will need to cook your pumpkin first, and use more fresh pulp. Cut your squash in half and remove the seeds. Place the squash skinside down on a baking dish, and bake at 350 degrees until the flesh is tender and the cut edges have caramelized. Remove the squash from the oven and let it rest until cool. 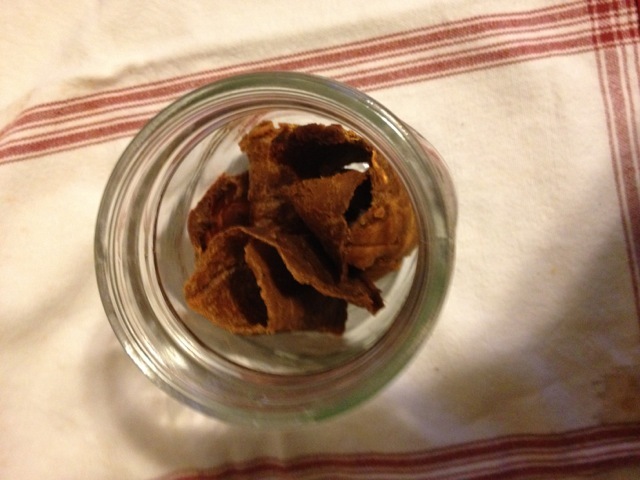 Scoop out the pulp and discard the cooked skins. Lunchtime? How about a pickled pepper sandwich? Out at the Regenstein Fruit & Vegetable Garden, there’s a whole group of volunteers with really interesting career histories and double-digit years of volunteer service. Larry Aronson is one of them. You’re likely to find Larry on Thursdays at his favorite volunteer station: the Pepper Discovery Cart. There, he presides over 120 different pepper samples and flavorings. “When I started volunteering 11 years ago, there were four pepper samples and a book on the cart,” Larry says. Think there’s only one kind of paprika? Think again. So he made it his mission to add to the cart. 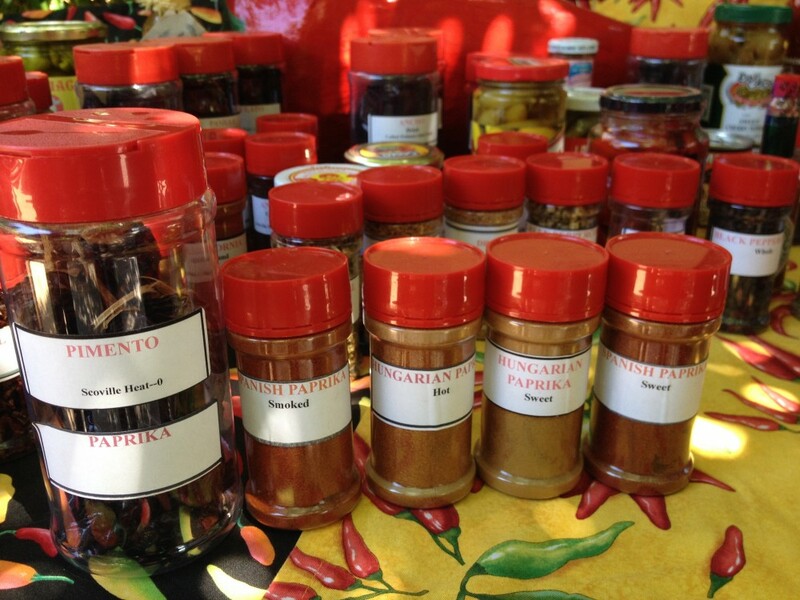 Dried peppers, ground peppers, pepper flakes and pepper sauces. Peppers from Brazil and Peru, France and Spain, China and Japan, Africa and South America. Well-known peppers like paprika (the seasoning made from dried and ground pimento peppers) and obscure peppers like Capsicum chacoense (an ancient species). Ask Larry a question about peppers and he’ll not only have the answer, but he’ll also add a conversation-starting fact or story to go with it. What’s his favorite pepper to eat? It changes over time. The Brazilian malagueta pepper is a current favorite that is “better than Tabasco,” Larry says. What’s the hottest pepper he’s got? Used to be “Ghost” (Buht jolokia), until he got a sample of Trinidad moruga “Scorpion.” Its heat level is said to be the same as pepper spray—essentially, inedible. Which peppers does he use in recipes? Cayennes. Jalapeños. Habañeros. Why? “Because they have the most universal and interesting flavors,” Larry says. He should know—he eats peppers every single day. Speaking of recipes, Larry recommends a favorite resource: Chile Pepper magazine. He owns every issue, and says it has the best recipes in the world. 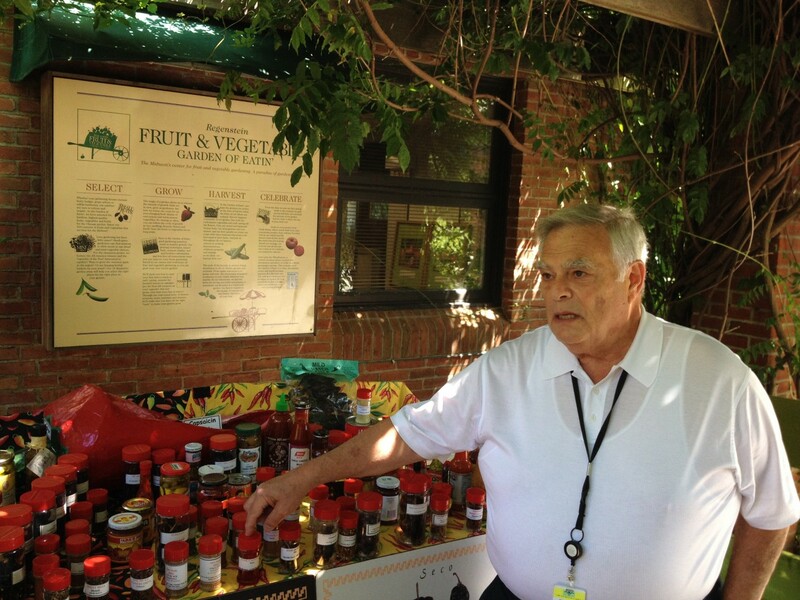 Volunteer Larry Aronson at the Pepper Discovery Cart—come and chat with him on Thursdays! While talking recipes, Larry mentioned that he had a new favorite sandwich, using his favorite recipe for pickled red peppers. Naturally, we asked if he’d share. In a saucepan, bring the first six ingredients above to a boil. Add the carrots to the boiling liquid. When carrots start to soften (test with a fork), remove from boiling liquid. Pack carrots, chopped onions, and a mix of 50/50 chopped sweet and hot peppers into sterilized jars. (Follow manufacturer’s instructions for sterilizing jars and lids.) Pour hot pickling liquid over vegetables, filling to ¼-inch from the top of the jar. Seal with sterilized lid and screw top. Let sealed jars cool. Larry stores his pickled peppers in the refrigerator for several months. To make a great sandwich: On homemade white bread, spread mayo, then layer with sliced turkey and pickled red peppers. Alternate serving: Cube fresh turkey and combine with mayo and pickled red peppers as turkey salad. Delicious served with chicken, too! Posted on August 14, 2014 August 8, 2014 Author Karen Z.Categories Garden NewsTags cayenne, habanero, hot peppers, jalapeno, recipes, sandwich, sweet peppers, volunteersLeave a comment on Lunchtime? How about a pickled pepper sandwich? 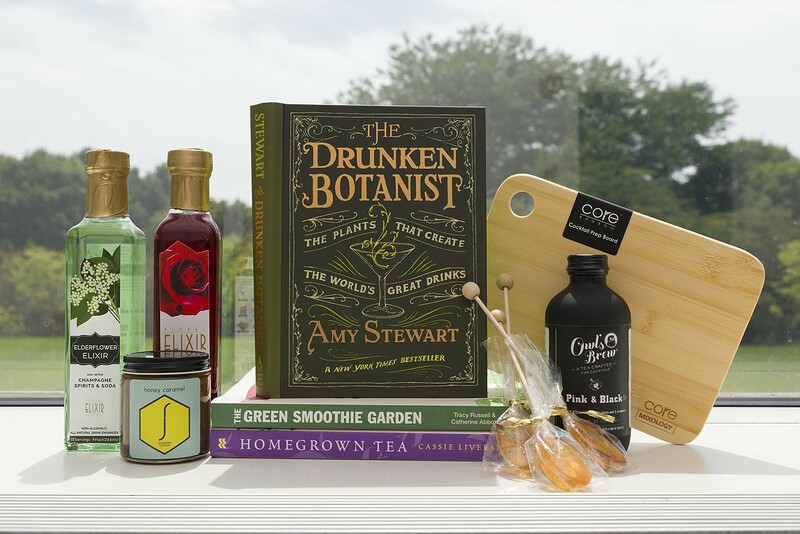 Speaking of infusions, “herb mixologist” Kasey Bersett Eaves had enthusiastic crowds at the demo tent on Saturday and Sunday, as she opened our eyes to the world of herb-infused beverages. 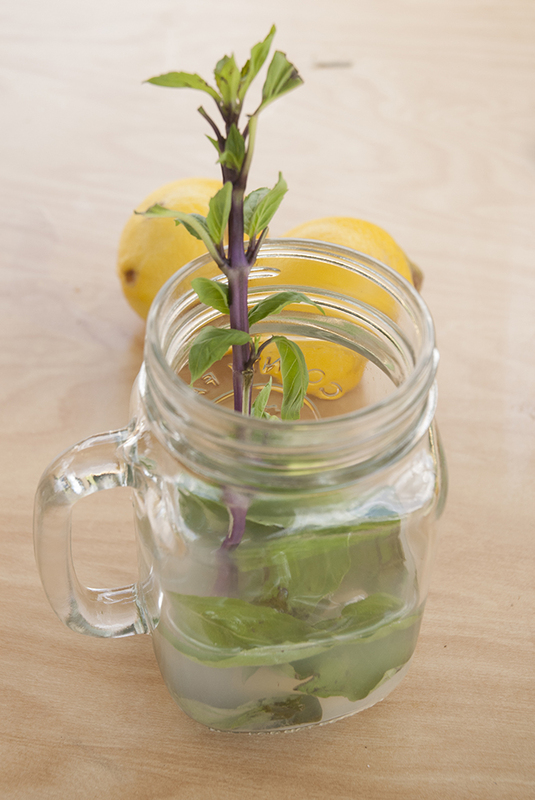 Muddled basil adds a refreshing twist to lemonade. Thirsty for more? Let’s move on to muddling. Here’s the first rule of muddling: Don’t overmuddle. 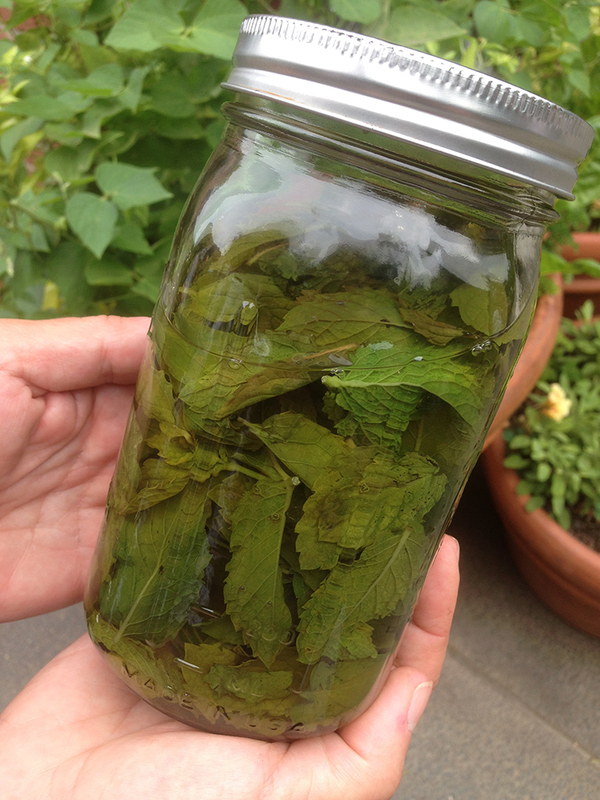 Muddling is the process of gently—repeat, gently—bruising the leaves of herbs. As Kasey said, “If you hear the leaves tear, you’re overmuddling.” The goal is to release the fresh, green taste and aroma of the leaves, not to break or pulverize them (think Cary Grant, not Iron Man). Herb Garden Weekend presenter Kasey Bersett Eaves demonstrates proper muddling technique—check out the natural wood muddler. Here’s the second rule of muddling: always hold your arm at a 90-degree angle, pressing straight down from the elbow through the wrist through the muddler. (What’s a muddler? Read on.) Press down once, release, and rotate the jar a quarter turn. Repeat five more times. Six presses are about right for a single drink—more if you’re making a pitcher’s worth. Here’s the third rule of muddling: muddlers are very cool. Essentially a press that reaches to the bottom of a glass or pitcher, muddlers can be found at most kitchenware stores, both in hardwood (walnut, maple) and stainless steel versions. Yes, a wooden spoon works, too. Vintage aficionados: look for stainless steel bar sets from the ’50s and ’60s. That big bump at the end of the long swizzle stick is a muddler. A muddle of fruit and herbs, destined to become a tasty beverage. Wash fruit and rinse herbs thoroughly. Place enough herbs inside the jar to cover the bottom. Add about a cup of fruit. (Amounts of both will vary according to taste—feel free to experiment!) Bruise fruit and herb leaves with muddler to release some of the juices and flavor. Do not pulverize! Fill jar with ice and water. Cover and refrigerate for two hours. Strain water into glasses. Refrigerated infusions will keep in the refrigerator up to five days. In summer, iced tea is the beverage du jour. Love sweet tea, but don’t like its sugar? Kasey’s tea recipe uses fresh stevia—an herb that’s 30 times sweeter than sugar—plus other herbs from your garden for a greener version of sweet. Just add ice and a tall glass. An infusion of mint and stevia makes a refreshing, instant herbal tea— just strain and serve over ice. For concentrate: Rinse and drain herbs. Add all ingredients above to a small, nonreactive pot and bring to a boil on the stove. Let boil for one minute; remove from heat. Allow mixture to steep and cool six hours or overnight. Strain cooled liquid into a glass jar. Store in the refrigerator up to one week, or freeze for later use. To use: Mix 1 cup of concentrate to 3 cups water, or to taste. “Simple syrups” are called that for a reason: they’re truly easy to concoct. Added in place of sugar to your favorite lemonade, soda, sweet tea, or cocktail recipe, simple syrup is the secret to a full-flavored summer drink. 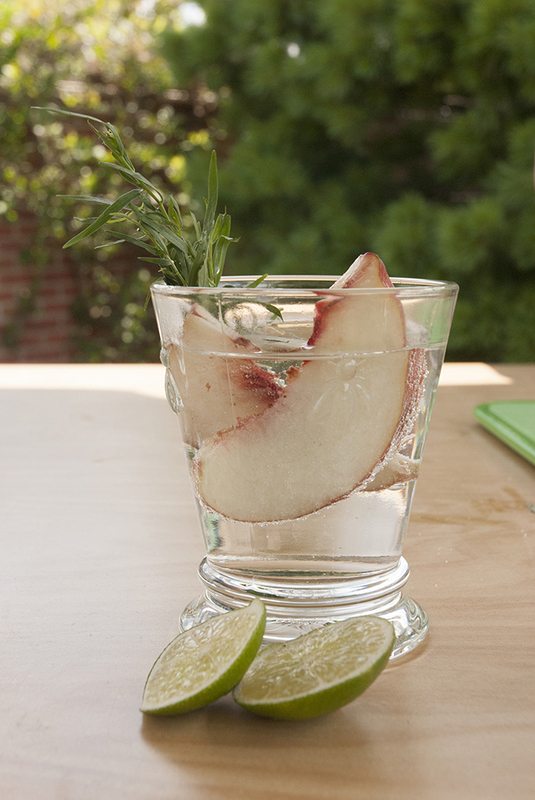 A simple syrup drink made with tarragon + peaches + Prosecco = lovely. Rinse and drain herbs. In a small, nonreactive pot, stir water and sugar together over heat until sugar dissolves, bringing the mixture just to a boil. Add herbs in, stir gently for 30 seconds, then remove from heat. Let the mixture cool (approximately 30 minutes). Strain. Store the syrup in an airtight container in the refrigerator for use within a week to 10 days, or freeze in ice cube trays for convenient later use. Simple syrups make memorable cocktails. Add a splash of herbal simple syrup to a champagne flute before topping off with Prosecco or dry white wine for a cheers-worthy toast. Or enjoy your herbs on ice—freeze the syrup in ice cube trays (top off each cube divider with a small herb leaf for garnish before freezing) and use as a sweetener for iced tea or cocktails. Imagine a glass of bourbon that slowly becomes a mint julep because you added minty simple syrup ice cubes! Stock the hippest minibar in town—yours—with your own herbal elixirs, concentrates, and simple syrups from the Garden Shop. Interested in dabbling in the cocktail arts yourself? Kasey recommends The Home Distiller’s Handbook as a good starter guide. Find drink enhancers and more at the Garden Shop, including elderflower and rose elixirs, and the mysterious Owl’s Brew tea concentrate—best with bourbons and whiskeys. Cheers!